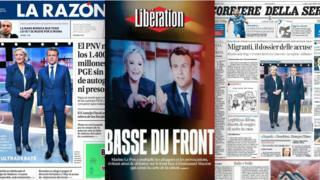 The French press dubs Emmanuel Macron the clear winner of the final presidential election television debate, in common with papers around Europe. But few think that the heated exchanges will have won over the 15% who say they are still undecided over who to vote for. Emmanuel Galiero and François-Xavier Bourmaud of conservative Le Figaro say "Macron held up and asserted himself against Le Pen" in a "debate of unprecedented brutality that lacked substance". Marine Le Pen "launched all-out war in an attempt to stifle her rival", but Emmanuel Macron "dominated his opponent on economic issues". Overall it was a "dialogue of the deaf… as the positions of the two candidates appeared totally irreconcilable", the correspondents conclude. Centre-left Le Monde agrees that stark differences were on display in the "brutal debate", and sides clearly with Mr Macron over his "repeated denunciations of the 'nonsense' talked by the National Front candidate". Left-wing Liberation accuses Ms Le Pen of "drowning the debate in an avalanche of disinformation". Like several other papers, it fact-checks her "false and exaggerated statements". Image caption Liberation says Ms Le Pen "drowns the debate in an avalanche of disinformation"
Top-selling Ouest France says its fact-checkers found all of her accusations to be false or vague, and sometimes reflected the "agenda of pro-Russian or far-right internet sites". Catholic La Croix's Francois Ernenwein, like Cecile Cornudet in Les Echos business daily, complains that the debate was "relentless without ever gaining clarity", but gives Mr Macron credit for "trying to answer his opponent's accusations without losing his cool". In Germany, centre-left Sueddeutsche Zeitung's Leila Al-Serori thinks "neither candidate brought any new programme details to the debate, but rather wheeled out all their guns for the final TV duel". She says that Emmanuel Macron "came across as presidential and self-confident, but also a bit arrogant: he gave as good as he got, but did not rise to her bait", while Marine Le Pen was "domineering, mocking and the more relaxed of the two, but did not appear stateswomanlike". Like many commentators, she deems it "hard to see how either could have won over undecided voters". Sascha Lehnartz of conservative Die Welt says the debate - "by far the worst of the Fifth Republic" - "went off the rails from the first minute", descending into "one long screaming match until an acceptable level was reached at the end". Image caption Die Welt says the debate "went off the rails from the first minute"
He partly blames the two TV presenters, "who barely deserved the title", and agrees that undecided voters will not have been helped by the debate. Like all commentators, he notes that a viewers' poll made Mr Macron the clear winner of the night. "One can only hope that the poll reflects reality. For either Emmanuel Macron wins on Sunday, or else it's all over for France," Lehnartz concludes. Michaela Wiegel in the centre-right Frankfurter Allgemeine Zeitung also deplores the level of exchanges in "the most vague and aggressive debate the history of French televised presidential run-offs", in particular highlighting Ms Le Pen's charge that Mr Macron would "take his orders from Berlin". The paper also hopes the viewers' poll is correct, as "given Le Pen's anti-EU stance, the vote concerns the fate of Europe". In Italy, Corriere della Sera's Stefano Montefiori says Ms Le Pen's poor poll ratings mean "she had nothing to lose and so went all out, not to present her programme but to attack her opponent". Anais Ginori of La Repubblica thinks she "used the Trump strategy of alluding, insulting and confusing" in contrast with her efforts in the first debate to try to seem "calm and ready to rule". The correspondent says Ms Le Pen "appeared more spontaneous and expressive than Macron", but "largely failed in her effort to unnerve her opponent, who mocked her for consulting her notes as a sign of not knowing her stuff". Image caption La Repubblica says "it was almost a fight"
In Spain, centre-right El Mundo's correspondent Anric Gonzalez was dismayed by a "violent and messy debate… that degraded both contenders". "Marine Le Pen appeared angry, as she represents the angry France damaged by globalisation and the single market… while Macron tended to get lost in the details, " he thinks, concluding that Mr Macron prevailed as the "lesser evil". In Poland's liberal Gazeta Wyborcza, Piotr Moszynski of Radio France Internationale writes that the debate was "chaotic, with Marine Le Pen constantly referring to her prompt cards, avoiding the questions, and speaking off topic," and concludes that it is "unlikely to change voter preferences". The lasting impression that many commentators took away from the debate was its unpleasant tone, and this was not lost on French viewers either. Danish state broadcaster DR1's correspondent Stephanie Surrugue reports that the "atmosphere approached the hateful… shocking many television viewers who quickly expressed their disappointment at the level and tone on social media." Macron v Le Pen: What are their visions for France? What does French result mean for Brexit?